Yep, that’s right! 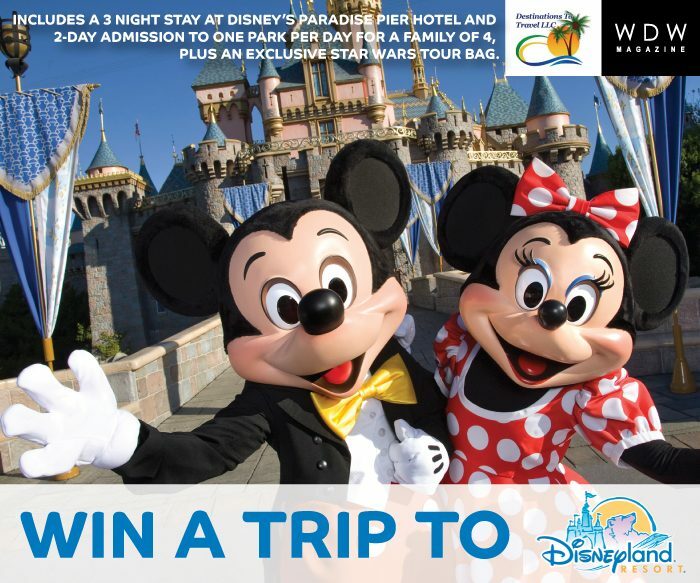 WDW Magazine and Destinations to Travel are giving away a trip to Disneyland! In preparation for the opening of Star Wars – Galaxy’s Edge at Walt Disney World, we want to send one lucky family to Disneyland! This giveaway includes a 3-night stay at Disney’s Paradise Pier Hotel and a 2-day admission to one park per day for a family of four, plus an exclusive Star Wars tour bag. A huge thank you to our amazing partners at Destinations to Travel for sponsoring this giveaway. If you’re planning a trip to any of the Disney parks, Disney Cruise Line or Adventures by Disney, go ahead and get in touch with Destinations to Travel. Their services are completely FREE, and they’ll help make your trip even more magical.